Well, the new star did the business when required - Hamilton took pole for the British GP and Raikkonen had to be content with second spot. Hamilton's performance fitted into what is becoming his usual pattern: he did enough to get through to Q3 and then saved the magic for his very last run. For a long time it looked as though Alonso had the measure of him here but it proved not so. Lewis begins to seem unstoppable. In contrast, Kimi appears to be gaining the upper hand over his team mate, Massa. All weekend he has been the quicker of the two Ferrari drivers and he has a new aura of confidence about him. Couple that with the fact that Ferrari and McLaren are about as equal in performance as it is possible to get, and we have the prospect of a hard-fought race ahead of us. Much depends on who makes the best start tomorrow, of course, and, judging by recent form, that could well be Raikkonen. Alonso and Massa will be hoping to have some say in the matter too, although they might be better advised to try Raikkonen's French GP strategy of using the pit stops to get ahead. Any of the four could win this one. Robert Kubica upheld BMW's honor by grabbing 5th slot but two teams have caught the German cars in Qualifying at least: Toyota and Renault. Ralf led the Toyota charge in 6th, perhaps spurred on by rumors about his future or lack of it, then came Kovalainen and Fisichella in the two Renaults. 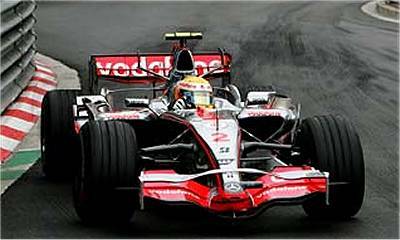 Heidfeld and Trulli completed the top ten, making the the front five rows of the grid the preserve of only five teams. The gap to the rest is very slim, however, and Red Bull and Williams (in spite of Rosberg not making it through to Q2 thanks to traffic and a yellow flag) might interfere with the cars just ahead of them. The Toro Rossos faded in Q2 after showing so well in Practice and Honda, having reverted to last year's car, improved slightly to put the Super Aguris in their place. Ah, Alianora, I must be careful not to bore my readers with too many mentions of Scott Speed. He did well in qualifying, as you say, getting through to Q2 and then being a little quicker than Liuzzi. I must admit to being a bit disappointed (although I should be getting used to it by now) that the promise shown in Practice was not realised in Qualifying. But he did well, yes. As for the race, I have only been able to see it through live timing as yet; in the States, Fox has seen fit to delay showing it until this afternoon. So I haven't seen how Wurz managed to take out Scott, although I could tell that it was all a bit of a mix up when Alonso came up to lap them. Until then Scott had been doing very well indeed, getting as high as tenth at one point and lapping at the same speed as the Renaults. Had he been able to finish, he would have claimed somewhere about 13th or 14th; nothing spectacular but a sign that the TRS are getting better all the time.